“The kind of work God usually calls you to is that kind of work (a) that you need most to do and (b) that the world most needs to have done … The place God calls you to is the place where your deep gladness and the world’s deep hunger meet.” Frederick Buechner, Wishful Thinking (1973). In the spring of 1953, Ed felt a clear, nonverbal call from God to go into the ministry. He was in his last semester of law school and attending the religious emphasis week services. The guest preacher was Dr. Robert J. McCracken of Riverside Church and Union Seminary in New York City. Ed had been raised and baptized as a Presbyterian, and he was a strong believer and an active participant in the Baptist Student Union. Yet this was the first time Ed had thought about the ministry as a profession and a calling. Yet it was clear, and he responded. Ed’s mother Jo Christman, who had herself wanted to become a lawyer, was surprised and a bit dismayed by this abrupt change in her son’s vocation from law to ministry. She wanted to make sure that Ed had not been talked into this change by someone else. Letters flew back and forth from Jacksonville to Wake Forest, and Jo did come to realize that Ed had found his true life’s work and no one had influenced him. Where was Jean when Ed was called to ministry? She was chaperoning a high school trip to Washington DC and came home to a surprise of her own. 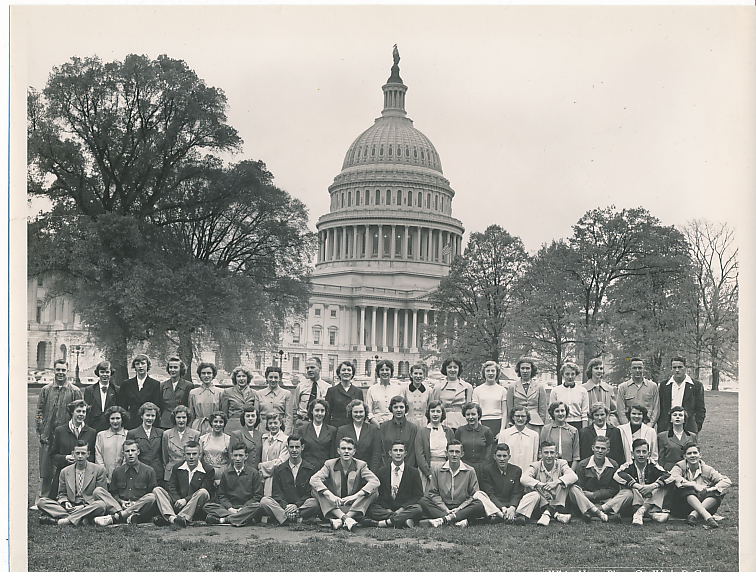 Jean, back row center, chaperoned several high school trips to Washington DC. Photo 1953. Ed applied and was admitted to Southeastern Baptist Theological Seminary, which shared the campus with Wake Forest College. He began seminary and a new career, leaving his old plans behind. Jean had to make new plans as well. She had expected Ed to start a law career, perhaps in another place, and in anticipation she had already resigned from Spring Hope High School, where she’d taught since 1951. It took several months for her to find another teaching position, this time at Bunn High School, where she worked 1953-56. Ed entered Southeastern Seminary in 1953 and began coursework for a divinity degree. He found that seminary was a different experience than law school. The structure of lectures, quizzes, and exams was the same, but it was more fun. Weekends found many of the seminary students preaching at various churches. Students were especially keen on Professor Leo Green’s lectures, which were quite sermon-like. They took careful notes, which were no doubt incorporated into their Sunday messages! 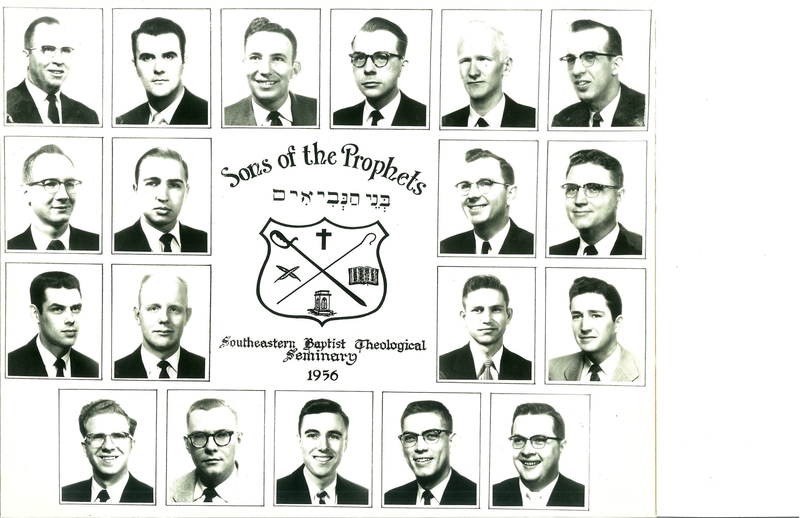 At Southeastern, Ed was a member of the Sons of the Prophets. Below is a photograph of the 1956 group. Despite the staid formality of the images, this student group was interested in a socially-progressive Baptist faith. 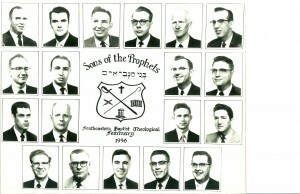 Sons of the Prophets 1956. Row 1: 3-Randall Lolly, 5-Ed Christman, 6-Troy Bennett; Row 2: 1-Robert Mulinax; 2-George Shriver; Row 3: 1-Vernon Wall, 2-Tom Frazier; 3 Bernie Cochran; 4-Bob Wyndcoff; Row 4, 4-Tracy Early, 5-Virgil Moorefield. “Our group was really the best students and the most creative students there, and we had discussions together and guest speakers at times. I was on the founding group between 1953-1956 and then invited to the meetings when I returned on the faculty (1959-1973). While in school, Ed began working part-time as the Baptist Campus Minister. He worked for J. Glenn Blackburn, then College Chaplain and pastor of the Wake Forest Baptist Church. Ed was quite familiar with the Baptist Student Union and with college life, so he had an easy on-the-job training. He had a playful engagement with them, including playing hallway basketball. He took a genuine and kind interest in everyone. Seiki Kinjo ’55: Ed is one of the most memorable and cherished persons in my life. My Wake Forest days are unthinkable without him. Most likely he was a Southeastern Seminary student when he first said “hello” to me on campus, since a white haired guy with a thick heavy looking book (a Greek Bible?) is a lingering image of Ed at the old Wake Forest campus. A farewell party Ed and a group of students gave me is still fresh in my memory. I was so overwhelmed with gratitude as to be literally unable to utter even a word of thanks. It was around the time of commencement in 1955. I cannot recall Ed ever even suggested going to church to me, but, in retrospect after about 60 years, I find him an embodiment of the wonderful qualities of Wake Forest, whose motto is Pro Humanitate. To me, an immature foreigner from an occupied island of Okinawa then, Ed was a shining fellow living up to like his name Christman. When Dr. Blackburn was on leave in the summer of 1955, he appointed Ed as the interim pastor of the Wake Forest Baptist Church. For the first time, Ed performed the full range of pastor’s duties, including funerals for seven townspeople that summer. Ed could see that his work with college students was quite different than the cradle-to-grave support provided by church pastors to their congregations. In 1956, Wake Forest College moved from Wake Forest, NC, to Winston-Salem NC, to establish a new campus. Ed and Jean had a choice to make — to move with the College and continue the job as Baptist Campus Minister, or to remain in Wake Forest to complete seminary. They decided to move to Winston-Salem, taking residence at the Wake Forest Faculty Apartments. Their first daughter Carolyn was born in 1957. 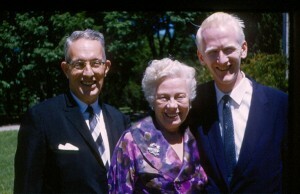 Ed and Jean stayed in Winston-Salem for three years and then returned to Southeastern in 1959 for Ed to complete his divinity degree at Southeastern. He was awarded a Bachelor of Divinity on May 13, 1960. While the move is celebrated in Wake Forest University history, it had a very different impact on the town of Wake Forest. The town and the college had been inseparable, and there was sadness there and among alumni who lived in eastern North Carolina. Southeastern Seminary had purchased the campus in 1951 and began teaching classes while sharing it with the College. Its important work and role continue today. Edgar D. Christman was ordained to the ministry on January 15, 1955: Edgar D. Christman was “solemnly and publicly set apart and ordained to the work of The Gospel Ministry by authority and order of the Wake Forest Baptist Church of Wake Forest, NC.” The ordaining council was: J. Glenn Blackburn, pastor of the Wake Forest Baptist Church; J. Allen Easley, Emmett Willard Hamrick, and George J. Griffin of the Wake Forest College School of Religion; Stuart A.C. Newman of Southeastern Seminary; and Edward G. McDowell. After Ed completed his degree from Southeastern in 1960, he applied for an additional year of study at Union Theological Seminary. He was awarded a Danforth Foundation Scholarship. The Danforth Foundation’s goal was to make an impact on the field of religion in higher education by awarding scholarships to promising campus ministers. One of Ed’s Columbia professors was Dr. Al Martin, a Wake Forest alumnus, who later taught at the Wake Forest Divinity School in Winston-Salem. Ed with Mr and Mrs. Kenneth I. Brown at the Lake Forest Danforth Conference in June 1960. Mr. Brown, Danforth Executive Director 1951-1961, was always known as KIB. In 1960, Ed, Jean, and baby Carolyn moved to New York City. They lived in Morningside Heights, on the upper west side. The family found NYC to be a fairyland and savored the new experiences, the adventures, and the friendliness.The Christmans received a steady number of visitors with whom they explored the sights. They also enjoyed visiting Wake Forest friends who lived in the City or nearby. For more about the New York years, see Traveler . During the school year, Ed completed the coursework in Theology, including the French requirement, with the help of tutoring by a retired French professor. He wrote his thesis on John Dewey’s concept of man. On May 23, 1961, he was awarded the degree of Master of Sacred Theology. presented at Riverside Church. Ed and Jean moved back to Wake Forest College and Winston-Salem in 1961, as Ed returned to his position as Baptist Campus Minister under Chaplain L.H. Hollingsworth. Ed and Jean Christman are life-long members of the Wake Forest Baptist Church. Ed and Jean joined the original Wake Forest Baptist Church when it was at the center of the original campus. Both Ed and Jean became members while they were students. Ed was baptized as a Baptist in this church; Ed and Jean were married in the congregation in 1952; and Ed was ordained there in 1955. When Wake Forest College moved to Winston-Salem in 1956, a new Wake Forest Baptist Church was founded to anchor the center of the “Reynolda” campus, while the original church remained behind. The organization of the new church was led by A.L. Aycock and J. Allen Easley. Ed and Jean transferred their memberships to the new church and were among its charter members. J. Glenn Blackburn, the Wake Forest College Chaplain and pastor of the original Wake Forest Baptist Church, was called to become pastor of the new church. The dual role of Church pastor and College Chaplain continued for a time in the person of Dr. Blackburn. In 1958, in recognition of the greater responsibilities on the new campus, the roles were divided. Dr. Blackburn continued as the church’s pastor and a separate position of Chaplain was created. Dr. Allen Easley of the Religion Department served as Acting Chaplain, until Dr. L.H. Hollingsworth arrived on the campus to become Chaplain in 1959. In 1961, Dr. Hollingsworth hired Ed back to Wake Forest to be Baptist Campus Minister/Assistant Chaplain. Outstanding – I was a student (1962 – 1966) at Wake Forest in Winston-Salem, then also Union Theological Seminary (through 1969). Also was licensed to preach (December, 1961) at Moore’s Chapel Baptist Church, Saxapahaw, NC.